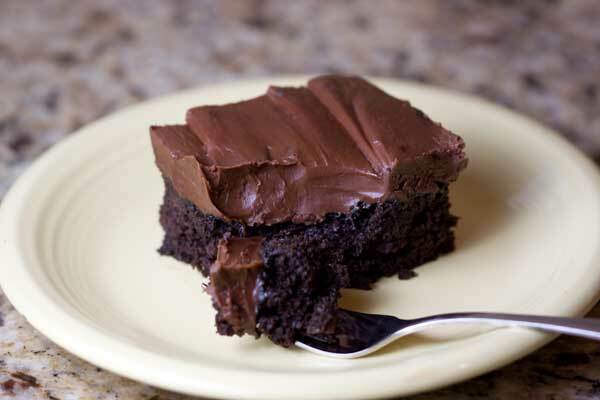 A serve-from-the-pan chocolate cake with a surprise ingredient -- sour cream! Try it for Wurstfest or some other German celebration. Preheat the oven to 350 degrees. Spray a 9x13 inch metal cake pan with flour-added baking spray. Spoon half of the sauerkraut out of the can and into a sieve. Drain well, pat dry, and chop it up on a cutting board or better yet, in a mini chopper or food processor. Save the rest of the sauerkraut for something else. In a medium size bowl, thoroughly mix the flour, cocoa powder, baking powder, baking soda and salt. Set aside. In a large mixing bowl using an electric mixer, beat the butter and sugar until creamy. Beat in the vanilla. Scrape the sides of the bowl and beat in the eggs, one by one. When eggs are blended, add the flour mixture alternately with the coffee, stirring on low speed, just until mixed. Stir in the chopped sauerkraut and the miniature chocolate chips. Pour the cake batter into the pan and bake on center rack for 33 to 35 minutes or until a toothpick inserted comes out clean. Let cool in the pan. When ready to frost, melt the butter in a medium size microwave-safe bowl. Add the chopped chocolate and stir until it is almost fully melted. Microwave at 50% power for another 30 seconds and stir until chocolate is fully melted. Scrape into a large mixing bowl. Stir in the ROOM TEMPERATURE sour cream and vanilla. Add the powdered sugar 1 cup at a time and beat with an electric mixer until smooth and creamy. For thinner frosting, add a little milk. Spread over the cake. **I sifted the powdered sugar before measuring so it was fluffy and only weighed about 3 ounces per cup. If you want to skip sifting because you plan on beating the lumps out with the mixer, just weigh out 12 ounces of un-sifted powdered sugar or measure out about 2 3/4 cups (volume) of powdered sugar. Whatever you do, don’t measure out 4 cups of un-sifted powdered sugar or you’ll be using over a pound of it. That being said, I recommend taking the time to sift the powdered sugar.